Puredistance I is understated elegance in its purest form. Built on the play of the soft and the crisp, the warm and the cold, the fruity flirtiness and the floral elegance, the aroma is as complex and as polished as the most precious diamond. With its impeccable proportions and sublime, multifaceted beauty, Puredistance I Perfume is the signature scent of many perfume connaisseurs. Created by Master Perfumer Annie Buzantian in New York, Puredistance ANTONIA is a highly original green floral with a great lushness and warmth of heart, but at the same time pillowy and gentle as can be. Key in the creation of ANTONIA is the image of a strong, positive, but at the same time gentle woman. The perfume is neither modern, nor old-fashioned. Puredistance ANTONIA is a timeless perfume with a feel of innocence, yet feminine and confident. She grabs you with gentleness and faithfully stays with you, tenacious, but never overwhelming. Ingredients: Jasmine, Rose Essence, Ylang Ylang, Orris, Ivy green, Galbanum, Vanilla and Vetiver. Puredistance M is sumptuous, sensuous and complex, but at the same time noble and sophisticated. Created in London by Roja Dove, M is inspired by the stylish comforts of the interior of a classic Aston Martin. Puredistance M is a leather chypre of classic proportions with an unexpected oriental twist, which lends the Perfume an original and modern feel. The warm smoothness of the blend is incomparable. The composition purrs softly along, weaving the leather accord into the road-map of spices, woods and resins. M, with its elegantly smoky leather, has a hint of excitement and danger, which is just how it should be in a fragrance inspired by Bond’s car. Perfumer Annie Buzantian from New York succeeded in creating a Perfume that revives the rich beauty of a bygone era in a modern and elegant way. OPARDU is full and lush and as the scent wears on, the more ethereal elements continue to shine and the overall effect is absolutely lovely. Ingredients: Tuberose Absolute, Gardenia, Bulgarian Rose, Purple Lilac, Carnation, Jasmine Absolute, Heliotrope and Cedarwood. 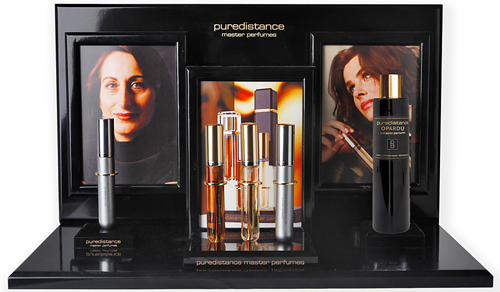 Puredistance BLACK is created in Paris by the famous French Perfumer Antoine Lie. He created a perfume of the highest quality that is close to the wearer and releases sensual and elegant scent layers in a whispering and sophisticated way - without shouting. A warm, mysterious and elegant fragrance, full of charm, that stays in the shadow, giving away - only every now and then - part of its nature. Puredistance BLACK plays hide-and-seek on the skin, appearing, morphing, and reappearing to delight the senses. Ingredients: As a consequence of the concept of BLACK (that treasures the beauty of the unknown) we will not reveal the ingredients of Puredistance BLACK.